This is a bit of a winded story …….. 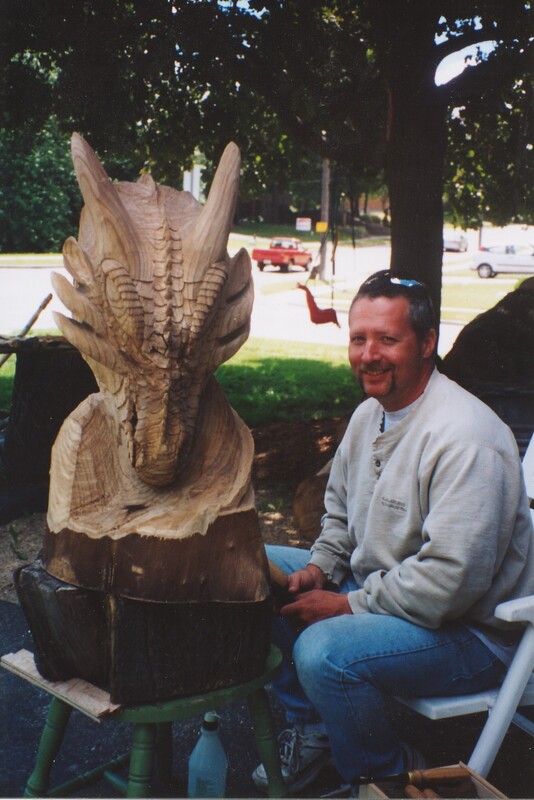 It was a cold autumn day in November 2003 and the wind was blowing, when I first started carving. Actually I was in the process of harvesting some wonderful Black Walnut trees with my trusty little 16in Homelite chainsaw. I had arranged, through a friend in the construction business, to get me permission to harvest the trees from a field being bulldozed for development. (These are the logs the City bylaw office is referring to as waste! Do you know how much Walnut is a board foot! ) Anyway I had just felled this huge tree, at least I thought it was huge, about 16″ dia and well over 40′ tall. It was while I was contemplating the best way to start dicing up the tree in the most economical way, whilst dealing with my anger over the theft of my statue Wilson, that I saw a vision of a face in the trunk of the tree. Going back several years ago, I had acquired what I consider to be my first frivolous self indulging impulse purchase. I bought on first sight, without asking the price mind you, an Easter Island head statue made of cement for the garden. No big deal you say? Well you need to understand that historically whenever I have come across an item like this, especially one in the few hundred dollar range, I would usually hum and ha over it and then not buy it. I would then go home and think about it for a few days or weeks or months and if I finally decided that I wanted to buy it, it would usually be gone or sold out by then. This was not a tool, something I could obviously use to save money by making something myself rather than buying it. This was a statue, with no intrinsic value! 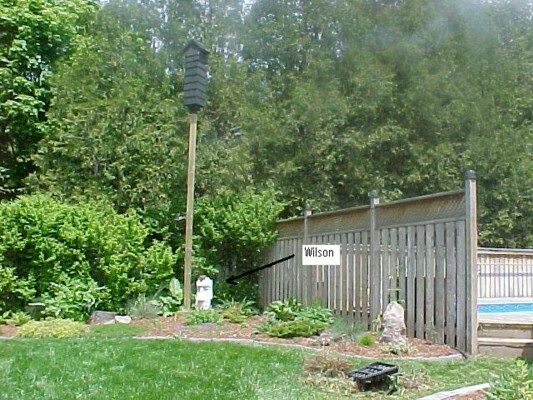 Well it was during the Octoberfest 2003 weekend in Kitchener, that some unscrupulous inconsiderate fools decided that Wilson would be better off somewhere else. You can only imagine my despair at discovering the loss of Wilson. I was devastated and angry at the violation of this theft. The anger was consuming me and the best thing to get that off my mind was work. Thus the harvesting of the trees! Originally I had planned to cut the trees and have them milled into lumber. But when I was staring down at the trunk of the huge Walnut tree, I saw the face of Wilson and the idea came to me. I will give Wilson new life! He may not be pretty but he will live again. So I hauled the log home and proceeded to plan Wilson’s rebirth! I started with a potato and tried carving it in a likeness of Wilson. After a few tries I got the hang of it and tried my hand at a small log. It wasn’t too pretty, but I liked it! So I got the chain saw out and went to work on the 16inch x 6 foot Walnut log and came up with Wilson the 3rd and it turned out great! I have not stopped carving since!